$30 Off Clothing Subscription Box with Promo Code! 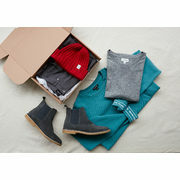 Frank & Oak Frank And Oak: Take $30.00 Off Your First Clothing Subscription Box with RFD Exclusive Promo Code! $30 Off Clothing Subscription Box with Promo Code! Take the worry out of shopping and try out some new styles with help from Frank And Oak! Now through February 14, sign up for Frank And Oak's monthly subscription box, and you can get $30.00 off your first box using the RFD-exclusive promo code RFD30! Frank And Oak's monthly subscription boxes are a risk-free way to try out new styles. Simply head online to sign up, and you'll be asked a few questions about your size and style to help narrow your matches. Up to 3 on-trend items will be chosen for you each month, and prices typically range from $29.00 to $149.00. You'll be able to preview your monthly box before it's sent and confirm, customize, or skip the box all together. Once you receive your styles at home, you'll have 7 days to decide which styles to keep and if any styles aren't a fit, you can send them back for free. There are no monthly fees to sign up for this service, you just pay for the items you keep, and you can skip a month at no cost. However, each subscription box is subject to a $25.00 styling fee which is credited towards the cost of any clothing you keep. If you end up sending the entire box back, you will still be subject to the styling fee. You can also cancel your subscription at any time. This RFD-exclusive promo code is valid until 11:59 PM ET on February 14. Click here to learn more about Frank And Oak's monthly subscription boxes.